Brass has a class of its own. Beautiful brass fixtures, decor and antiques can lend an old-timey charm and a touch of elegance to your interior. 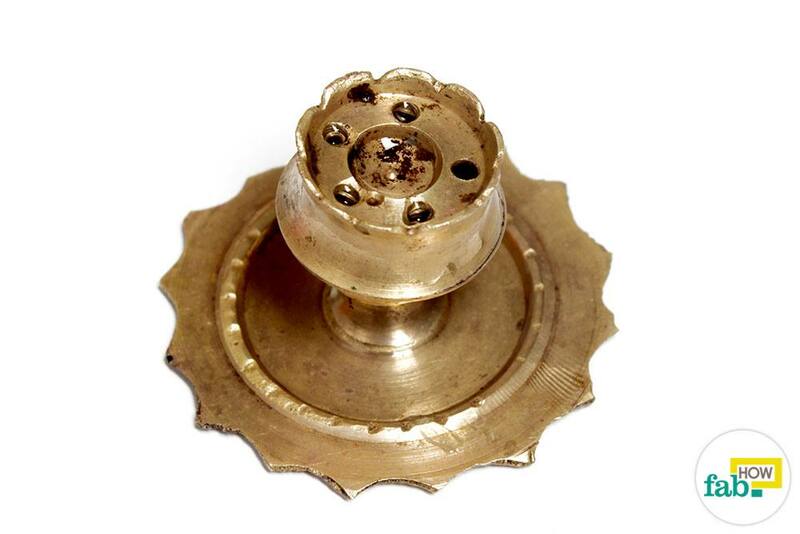 If your house is old enough, chances are that you have brass doorknobs, too. But dull and tarnished brass can be an eyesore. 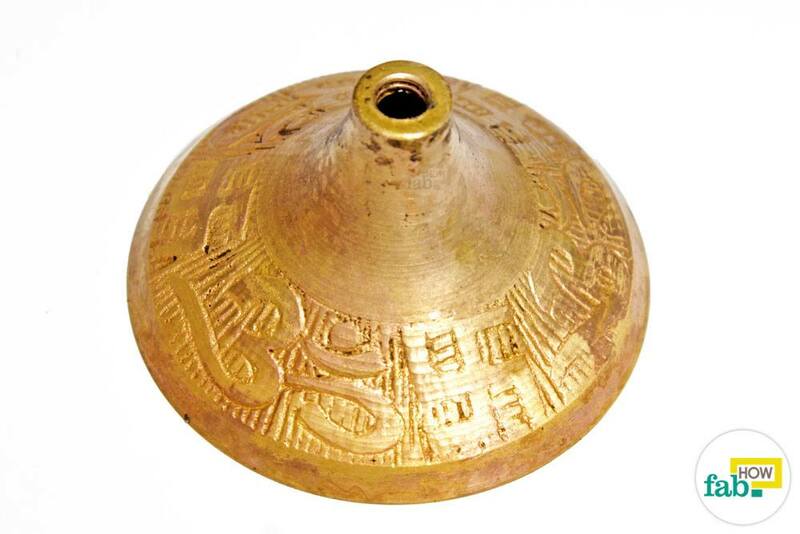 Brass is a metallic alloy made from a combination of zinc and copper in varying proportions. Various articles are fashioned from this attractive alloy. Its bright yellow gold-like appearance has made it a popular choice for cookware, jewelry and showpieces. Its durability also makes it suitable for making musical instruments as well as attractive bath fittings. 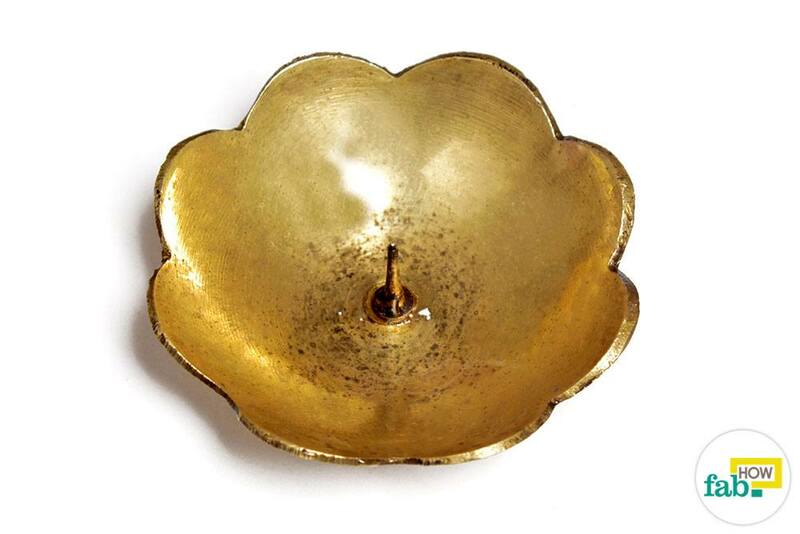 Despite being corrosion-resistant, brass items tend to become dull and tarnished over prolonged periods of time. Antiques may actually gain value with time-gathered tarnish, but most brassware requires tarnish removal from time to time to regain its splendor. Brass articles that are lacquered or coated with a protective glossy finish are easier to clean. All you need to do is give them a thorough wipe-down with a soft, damp cloth. It’s the non-lacquered brass that requires effort and elbow grease. Grime and dirt can be easily cleaned with mild detergent, but tarnish requires special cleaning agents that can break up the corrosion on the surface of the brassware. Rather than spending a fortune on expensive tarnish removers that often pose a health hazard, you can easily get the desired results with some common household items. 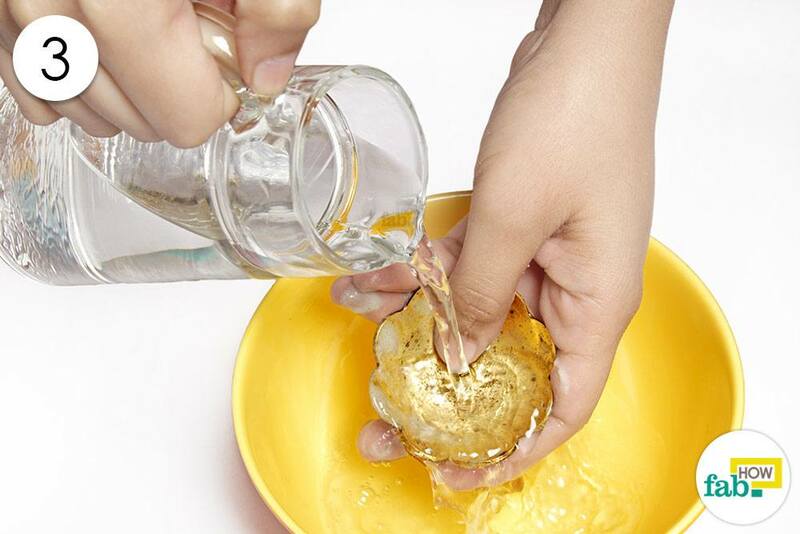 We tested some popular home remedies for cleaning brass, including combinations of vinegar, salt, baking soda, lemon and liquid dish soap, along with ketchup and Worcestershire sauce. Vinegar and salt produced the best results and is capable of removing the most stubborn tarnish stains. 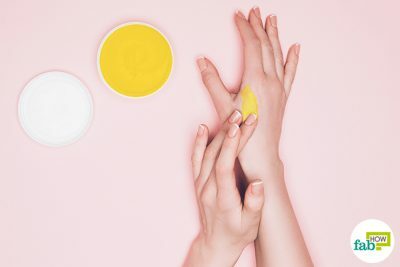 The vinegar and baking soda combo, along with lemon and salt, also gave good results for removing tarnish and grease spots. Liquid dish soap is a safe choice for regular cleaning, but won’t remove tarnish. Ketchup and Worcestershire sauce come in handy in a pinch, if you’re dealing with mild tarnish. However, the sticky mess of the ketchup may not be worth it, especially if you’re cleaning some cherished ornaments. 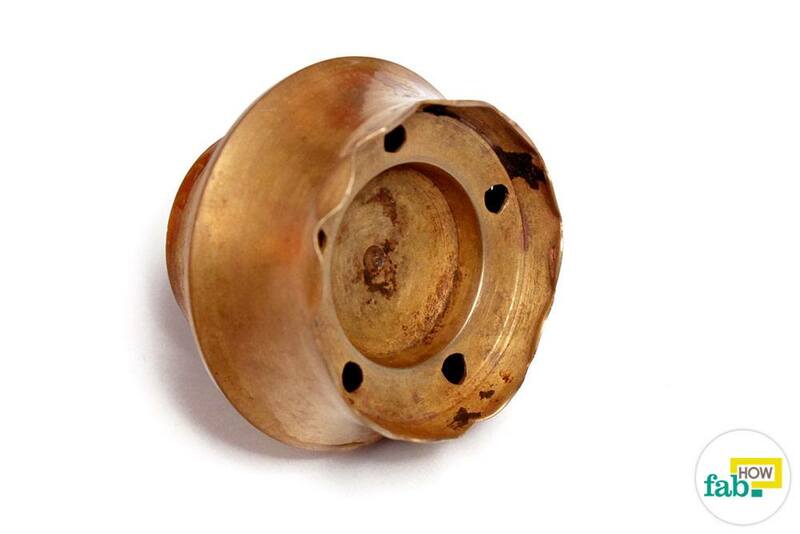 Before proceeding to clean your brassware, ensure that the articles are, in fact, made of brass. Some may just have brass plating. Such items should be cleaned with just hot water and mild detergent. Scrubbing and extensive polishing should be avoided, as it may damage the brass plating. Since a little tarnish is inevitable after decades of use, you can restore the shine on your brassware with 5 easy methods given below with real pictures. The combination of white vinegar and salt is the most efficient method for removing tarnish from articles made of brass. The acetic acid present in the vinegar helps break down the corrosion at the surface of the alloy. Salt mostly acts as an abrasive, but also provides minor aid in the chemical reaction. Once the chemical reaction weakens the corrosion at the surface, you can scrub it off with any cleaning brush. A discarded toothbrush or a nailbrush suits this purpose well. 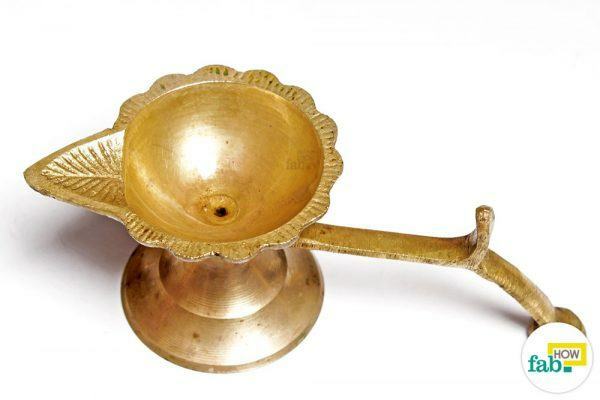 Place the tarnished brass item in a bowl or a container suited to its size. Pour white vinegar over it, wetting it completely. 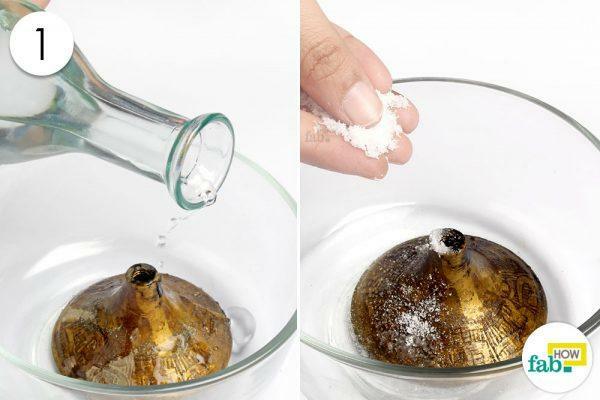 Sprinkle salt liberally over the item. Let it sit for 30 to 60 minutes. 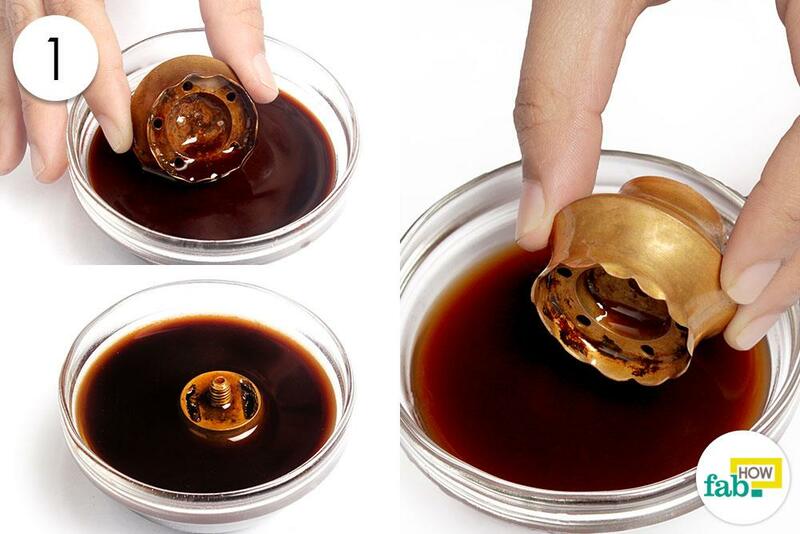 For extremely stubborn tarnish, you can leave it for 2 to 3 hours. 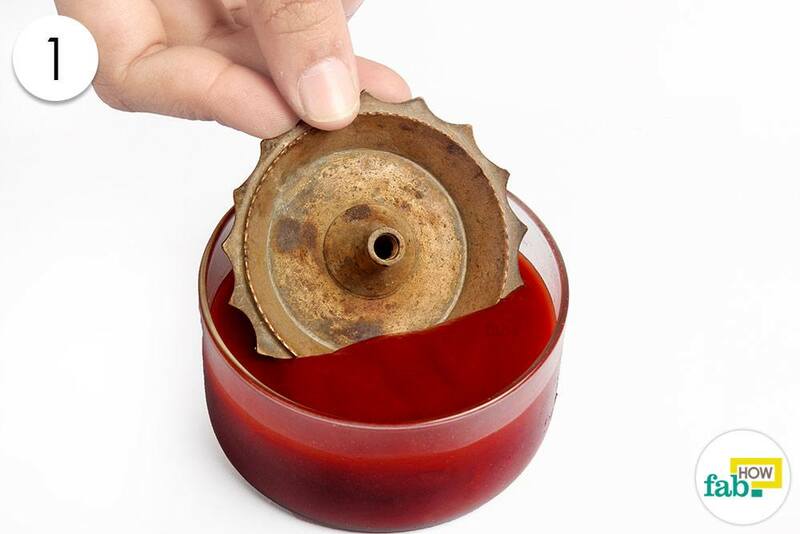 Use a nailbrush, toothbrush or small cleaning brush to brush the brass item and remove the tarnish completely. 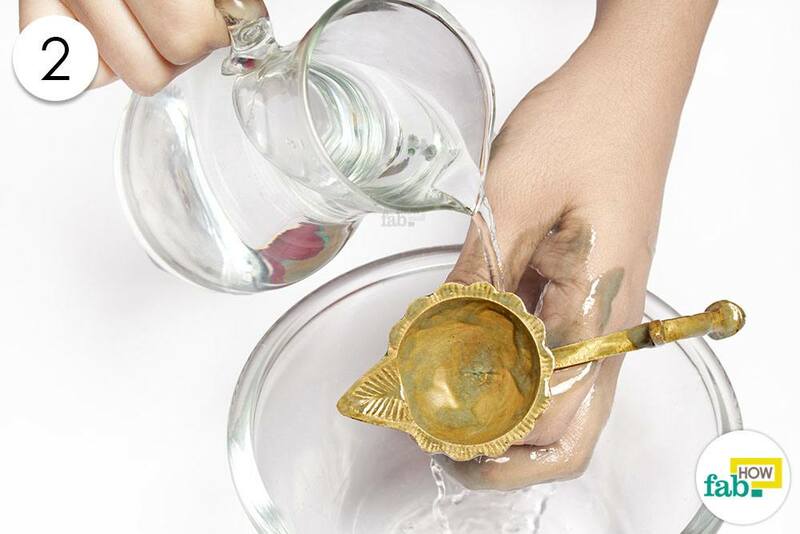 When the tarnish is well removed, use a soft towel to wipe the item and buff it to shine. 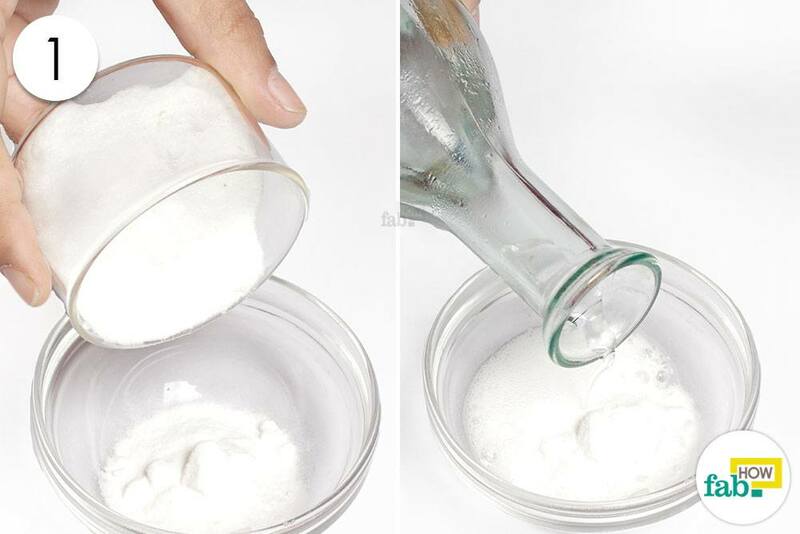 White vinegar can also be used with baking soda to remove tarnish from brassware. While vinegar weakens the tarnish, baking soda lends its abrasive power. If you’re working on brass pots and pans, baking soda can also help remove grease spots and other residual stains. Add a little white vinegar to it to make a paste. It will start fizzing but settle down as you mix it up. 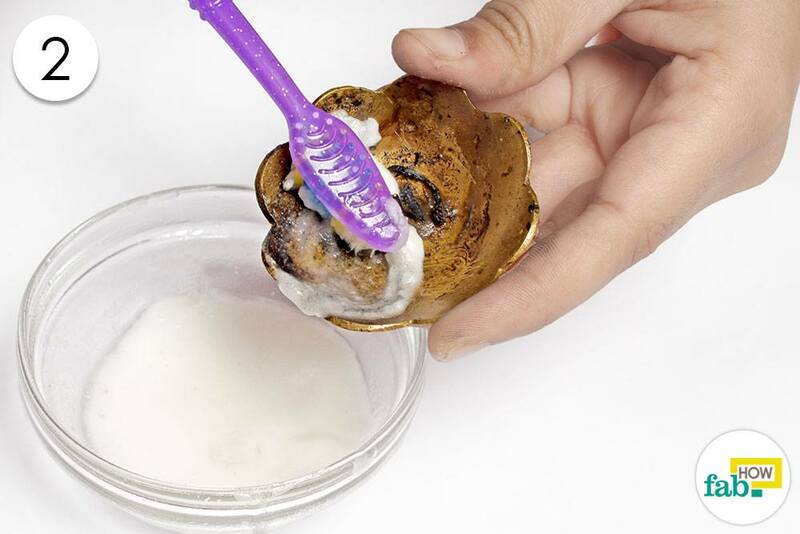 Take some of the paste on an old toothbrush and scrub it over the tarnished brass article. Scrub the entire article clean with the paste and the toothbrush. Rinse the item with plain water to reveal the brassy shine. If the tarnish remains in some spots, repeat the second step on the tarnished spots. Proceed to dry the item with a soft towel once it shines to your satisfaction. If it’s common dirt and grime that you’re dealing with, liquid dish soap should be enough to bring back the shine to your brassware. Liquid dish soap is mild and safe to use, but effectively tackles grease and oil stains along with stubborn grime. 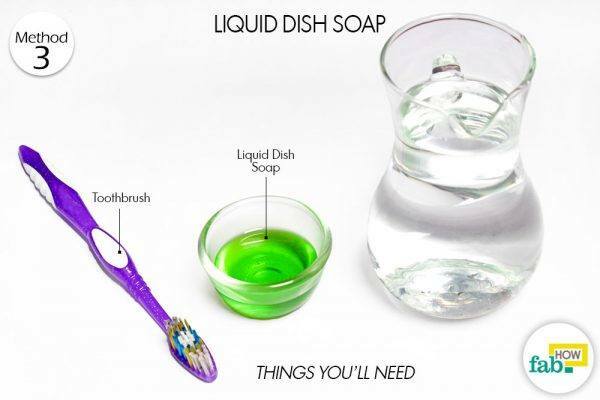 Dip an old toothbrush into liquid dish soap. Scrub the dirty brassware all over with the dish soap and toothbrush. Rinse the brass article with plain water once you’ve gone over it entirely with the toothbrush and dish soap. Dry the article with a soft towel. 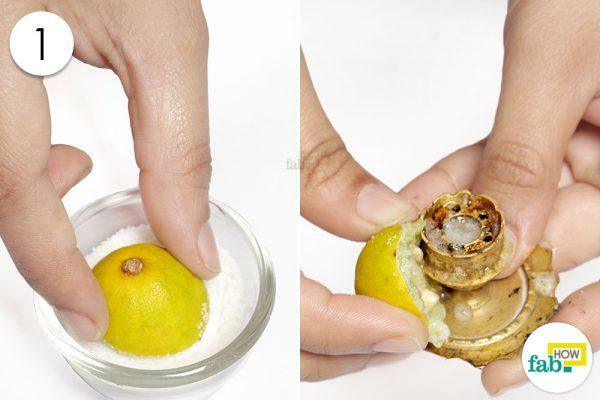 Lemon and salt is another effective method for cleaning your brassware and removing tarnish. The citric acid present in lemon is strong enough to break the surface corrosion on the brass. Salt acts as an abrasive and cuts through a variety of stains. Take half of a lemon and dip the fresh-cut side into salt. Scrub every inch of your brassware with this salted lemon until it shines. 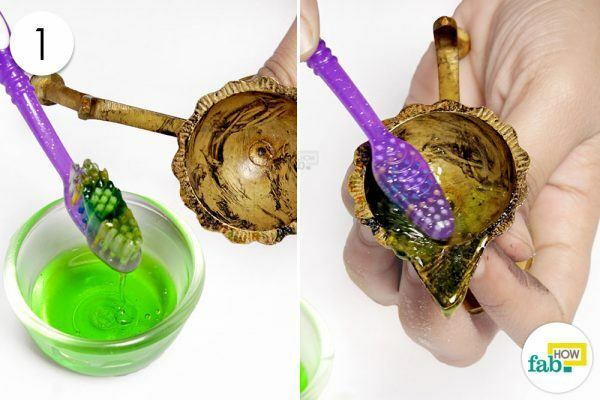 You can also use a nailbrush or toothbrush to get to the hard-to-reach places. 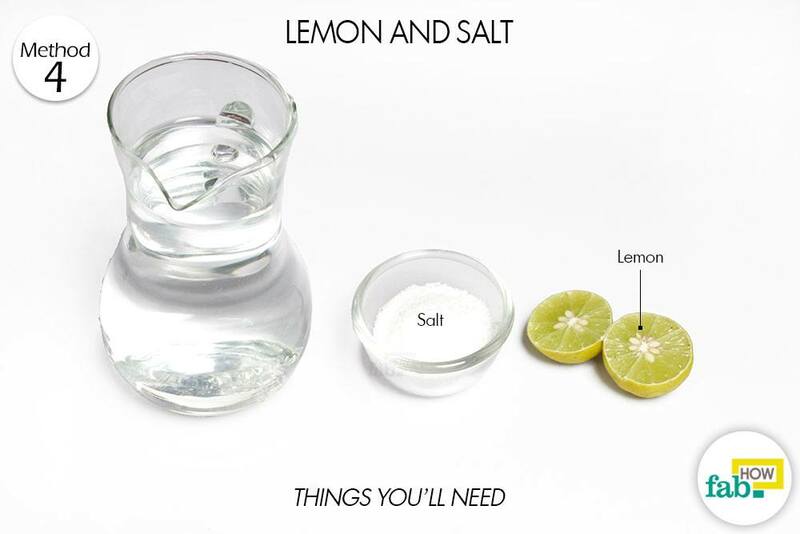 Rinse the brass item with plain water to wash off the lemon and salt. Dry the item thoroughly with a dry kitchen towel. 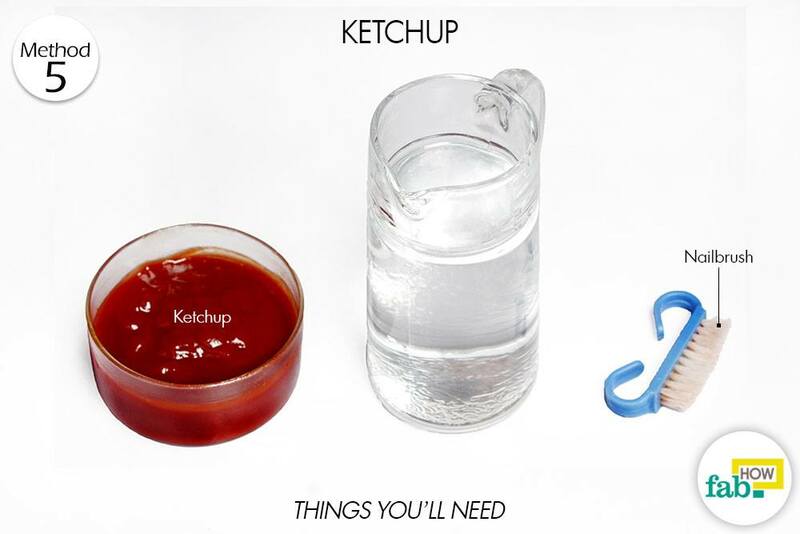 Ketchup contains distilled vinegar as well as salt, making it a handy tarnish remover in a pinch. 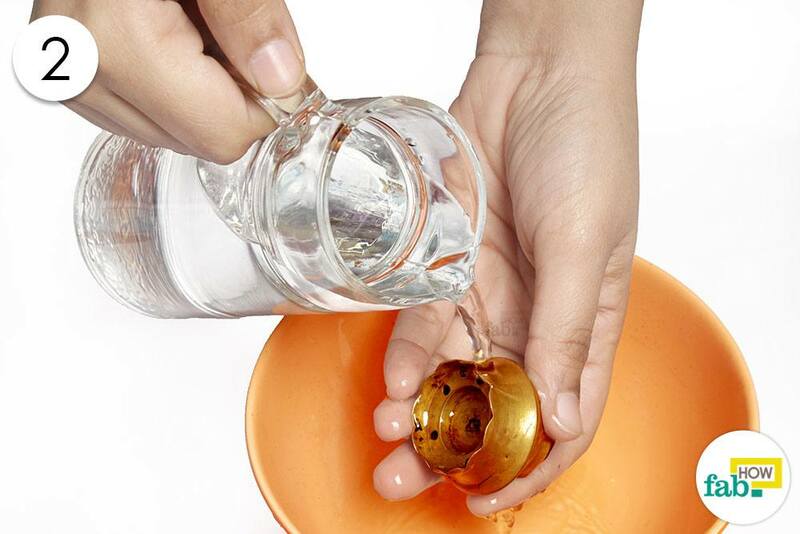 While it takes time to remove tarnish, you may also want to keep in mind its stickiness during the cleaning process. 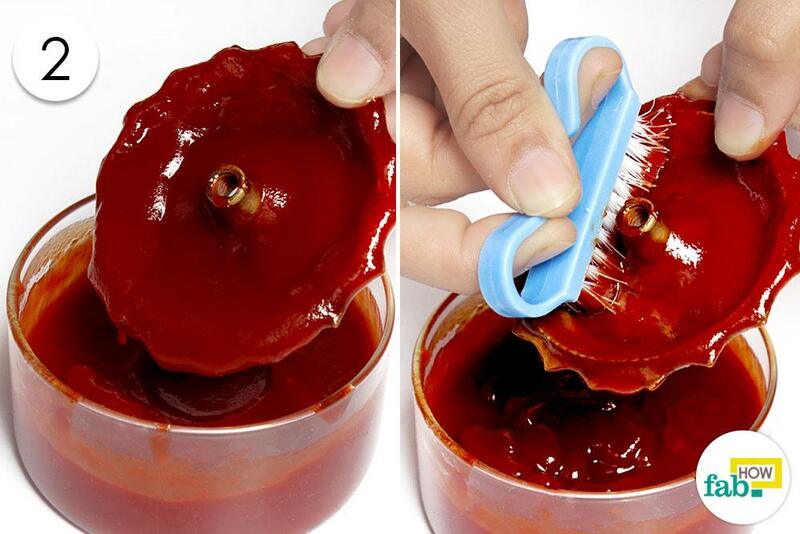 Fully immerse the brassware in ketchup and let it sit overnight. If the item is big, you can probably get away with covering it with a thick coat of ketchup. 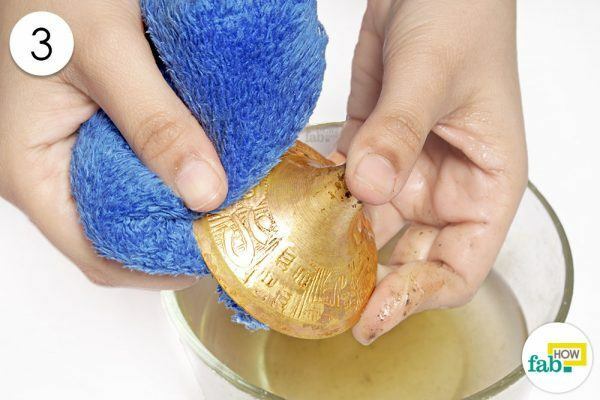 The next day, use a cleaning brush to scrub the loosened tarnish off the brass article. 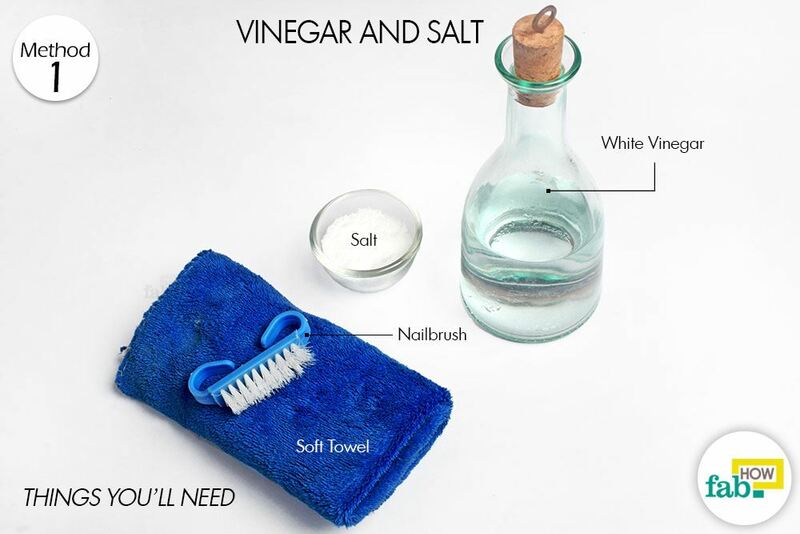 For small items, you can use a nailbrush or old toothbrush. This will allow you to clean the crevices and cavities effectively. When the brassware is cleaned, wash off the ketchup completely with plain water. Dry the item with a clean kitchen towel. Just like ketchup, the presence of vinegar and salt is what makes a tarnish remover of Worcestershire sauce. Completely immerse the brass item in Worcestershire sauce and let it soak overnight. Chances are that’s all you’ll need to do to remove minor tarnish from the brass. 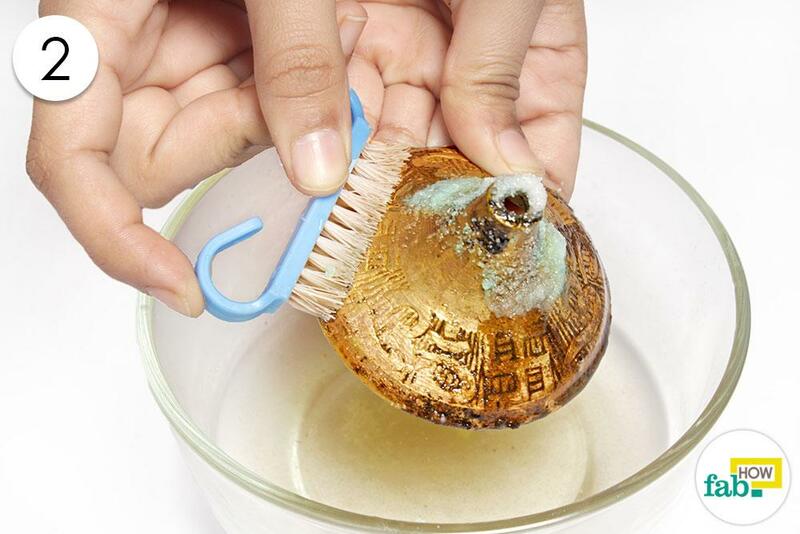 If some tarnish stains remain, use a nailbrush or old toothbrush to scrub it off. Rinse the brassware to wash off the sauce completely and dry it with a kitchen towel. To check if the article is made of brass, test it with a magnet. Brass is not attracted to magnets. If it gets attracted to the magnet, then it’s not brass. Antiques should be taken to an appraiser before you attempt to clean them yourself. 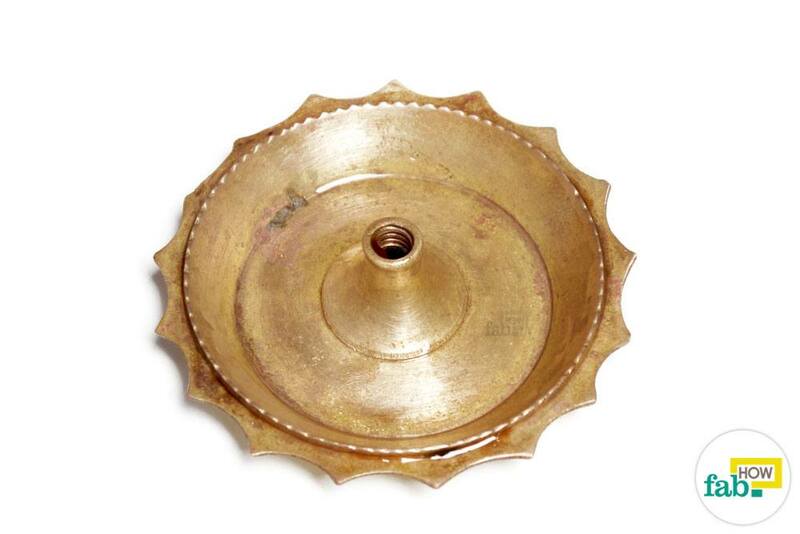 Consider coating brassware with a varnish or lacquer to prevent it from tarnishing again. Refrain from using steel wool and harsh scrubbing pads when cleaning your brassware. Tried the vinegar and salt method and super happy with the results. Thanks Fabhow for the awesome remedies.? I soak all my antique brass lamp fitting in vinegar for 3 days. After that, I scrub the parts in hot soapy water and use 000 steel wool. Everything cleans off beautifully. The brass is back to a pinky/brass color. Use a good brass/ metal cleaner, a bit of elbow grease, and wow. A beautifully cleaned Antique piece. So easy and satisfying. Thank you for sharing your feedback with us. Vinegar really does the magic with some elbow grease in cleaning anything and everything. 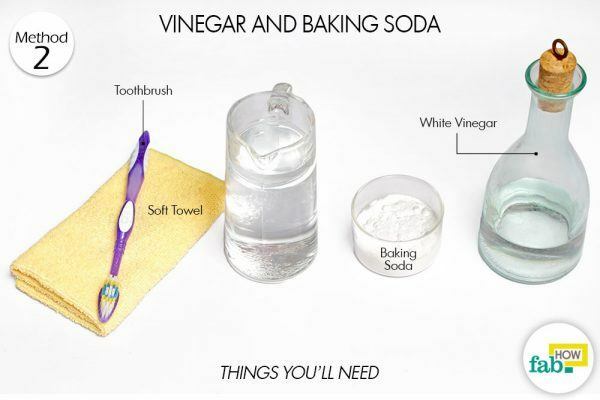 Visit here to learn more https://www.fabhow.com/use-vinegar-for-cleaning.html.